On Wednesday I received an email from Sephora saying “you purchased this in our store, how about writing a review online?” I’ve purchased things in the past from Sephora, but have never received this type of message before so am assuming it’s a new strategy. This is a huge win for Sephora. Bridging the brick and mortar with the online community creates an elevated engagement level that so many companies are trying to achieve. Not only that, but Sephora does such a good job on their website of offering “products you might like” as a result of your actual purchase (online or in-store) that they are truly driving you to buy more with their suggestions. I look forward to seeing how Sephora develops their online community. I see clear opportunities – videos on application and skin preparation would be a great starting point, with live-streaming of in-store facials and makeovers from Pros being next. 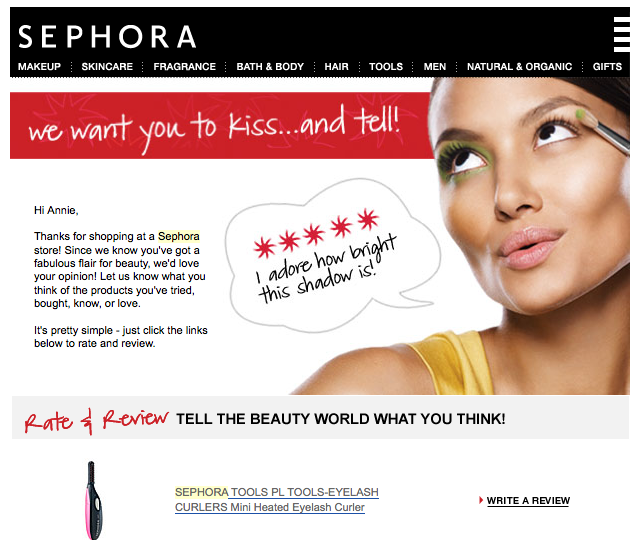 Great Sephora post,Innovators need to treat a website like a store front. This includes engaging the customer and asking for their feedback.Keep writing.